The United States Congress designated the Mount Jefferson Wilderness (map) in 1968 and it now has a total of 109,082 acres. All of this wilderness is located in Oregon and is managed by the Forest Service. Five glaciers mantle the slopes of stately Mount Jefferson, the dominant feature in this region of the High Cascades: Whitewater, Waldo, Milk Creek, Russell, and Jefferson Park. At 10,497 feet, Mount Jefferson challenges hikers with the steepest, most difficult climb of Oregon's high summits. 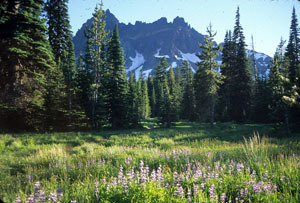 The southern portion of the area rests beneath 7,841-foot Three Fingered Jack. Most of the high country of this Wilderness is wide open, almost like a park, with scattered tree cover, long talus slopes, rocky outcroppings, alpine meadows, and year-round patches of snow. Between 5,000 feet and 6,000 feet you'll find more than 150 small lakes, about half of them stocked with trout. A grand forest of Douglas fir, silver fir, subalpine fir, mountain hemlock, lodgepole pine, ponderosa pine, and cedar mix with vine maple, huckleberry, and rhododendron to distinguish the lower elevations. The vast Warm Springs Indian Reservation shares a long northeastern border. Hikers can wend their way through approximately 190 miles of very heavily used trails, including about 40 miles of the Pacific Crest National Scenic Trail. Jefferson Park, Marion Lake, Pamelia Lake, and Jack Lake are the most impacted by human traffic. Planning to Visit the Mount Jefferson Wilderness? How to follow the seven standard Leave No Trace principles differs in different parts of the country (desert vs. Rocky Mountains). Click on any of the principles listed below to learn more about how they apply in the Mount Jefferson Wilderness.